Uber is the new age ride-sharing service taking the world by storm. We’ve used it a couple of times. Once when we needed a ride to the airport in Miami, and another time when we wanted to go out on the town and not worry about drinking too much to drive home. Both times the service was excellent. You put the App on your phone and you can see exactly where the Uber cars are and how long it would take one of them to get to your location. Just tap the screen and enter where you want to go and you know right away how much it’s going to cost. Once you’ve reached your destination, no money changes hands. It’s all done by the app and your stored payment information. It is especially useful in places like Europe when you are the stranger. The App you use works just the same as it does here in the US. It doesn’t matter that you and the driver can’t understand each other because you both understand the Uber App on your phone. It shows the destination. You can even watch the car as it travels the route. What does this have to do with RVers? It occurs to me that many people who travel by RV don’t have a car. Uber might make this a more palatable option. 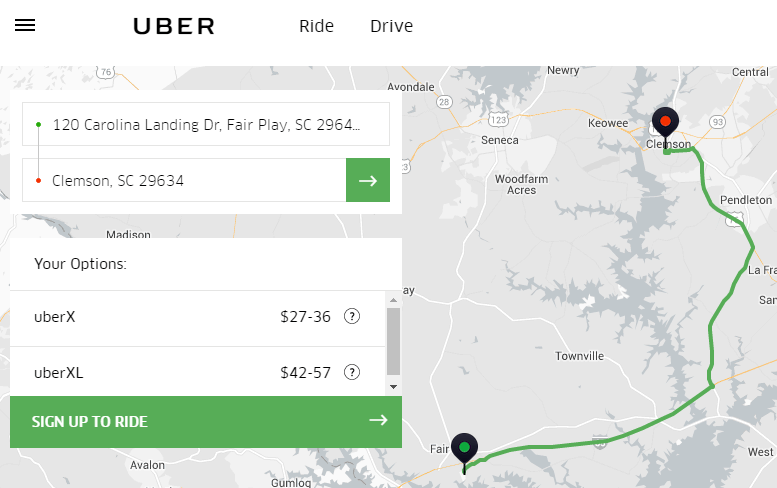 Although you won’t find Uber rides available in truly rural areas, you may be surprised at the smaller towns where Uber is available. You can use the Uber.com website “Find a City” to see if service exists in your location. We are currently at an RV rally (the Escapade) in Essex Junction, Vermont. Although not rural, this is certainly not a major metropolitan area. I open my Uber app and see that there are at least 6 Uber cars in circulation nearby and it would take one of them 12 minutes to get to me and give me a ride where I wanted to go. I also got a fare estimate from the campground to the nearest grocery (7 miles away) and it came to $9-12. Uber is a free app available on Apple iOS as well as Android. You must set up an account and a payment method, but it only takes a minute and you can be on your way! Published by MrsGeek, in Blog. Tagged with Android, Apps for Travelers, Blogs, Droid, iPad, iPhone, Smartphones, Thousand Trails, Uber, Uber.com. I use Uber a lot when traveling. Of course, most of my RV travel is for football/baseball games – college campuses and pro cities where Uber is generally available. Highly recommend it so that you do not have to tow a car. Great for part-time RVers like us!